United Nations: Government-led relief efforts are being stepped up at the tip of the Indonesia's two main islands of Sumatra and Java after a tsunami slammed into densely-populated coastal areas along the Sunda Strait on Saturday night. The UN humanitarian coordination office, OCHA, is reporting that as of Wednesday, according to the Indonesian National Disaster Management Agency (BNPB), 430 people are dead, 1,495 injured, and 159 are missing. Indonesia's Meteorology, Climatology and Geophysics Agency warned that a new tsunami could affect the area surrounding the Anak Krakatau volcano in the Sunda Strait. Authorities are alerting people to stay up to one kilometre away from the coastal area. The deadly tsunami is believed to have been triggered by an underwater landslide following a volcanic eruption on Saturday. 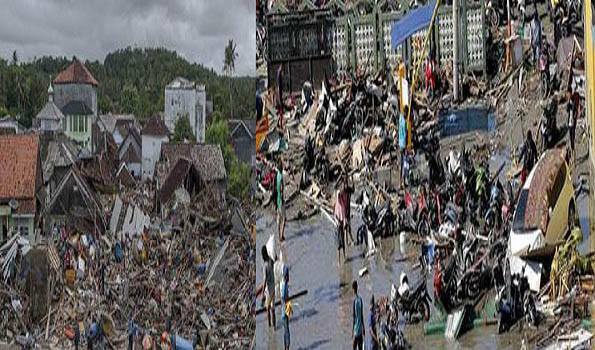 Wednesday marks the anniversary of 2004's deadly 26 December Indian Ocean quake and tsunami which killed more than 226,000 people in 13 countries, with Indonesia bearing the highest number of fatalities. "Most survivors have been huddling in temporary shelters away from the shore, but have started to emerge to search for loved ones and assess damage to their property," says Arifin M Hadi, Head of Disaster Management at the Indonesian Red Cross. More than 400 Red Cross staff and volunteers are reportedly delivering medical services and supplies to tsunami-ravaged villages. "Our teams are seeing many broken bones and broken homes, and people who are very shaken,? continued Mr Hadi. ?Indonesians have withstood a string of disasters this year and with them, so much loss and misery." Meanwhile, Jan Gelfand, head of UN partner agency, the International Federation of Red Cross and Red Crescent Societies (IFRC), support office in Jakarta, pointed out that previous disaster responses illustrated the value of providing rapid treatment for the injured, ?not only to save lives, but also to prevent long-term health complications.? ?The Indonesian Red Cross's mobile medical teams are reaching remote and hard-to-reach areas to treat people who haven't had help since Saturday," he explained. Since the December 2004 tsunami, Indonesian Red Cross staff and volunteers have received extensive disaster preparedness and response training, with volunteers in the weekend's hardest hit Banten province, having conducted tsunami awareness and response exercises with at-risk communities only two months ago.